Of course, Animo rarely disappoints me and this collection was no exception. 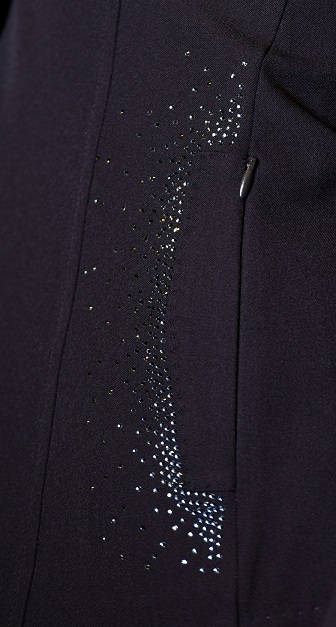 The Lakita coat might be my favorite “sparkly” coat I’ve seen so far. I like the seam and crystals on the shoulder area. The other interesting thing that stood out in Animo’s coat collection was the use of a textured fabric. I still haven’t decided if I like it or not, but it’s interesting none the less. The only kinda cool thing I saw at Equiline was these breeches with some tone on tone blocking down the leg. I can’t decide if these would be subtly flattering or just kind of distracting. In my mind’s eye they work. One Horse always has awesome new designs every season, this time with lots of sweatshirts. GhoDho’s soon to be released Victoria breech in Rouge is enough to make me wish my chunky thighs could fit into this brand without being grotesque. That color is perfect. I want ADE to make a breech this color! ADE did come out with a nice purple called Aubergine, though. Sadly I’m not really into purple unless it’s really dark, so my money is safe on this one. They have a tone on tone snakeskin too, similar to the black tone on tone houndstooth (Probably my favorite breeches that I own… which I guess are technically a print. Which I guess makes my earlier statement hypocritical. Does tone on tone really count as a print?). Not into snakeskin in general, but if you’re going to do a print, these are a pretty classy way of doing it. Asmar is one of my favorites, and they didn’t disappoint with their fall collection. They love an elbow patch just as much as I do, and have them on just about everything. Elbow patches are always the answer. I’ve had my eye out for this Horseware Marietta sweater ever since I saw it in the AW catalog early this year at AETA. Because if there’s anyone in the world who needs a big ol’ H-is-for-Henry sweater, it’s me. Welsh Wear is a corgi-centric brand, which is all I really have to say, right? They just came out with sweaters that have a corgi embroidered on the chest. A corgi. In a bow tie. On the chest. Put that on my Christmas list. I’ve already talked about Kastel’s merino 1/4 zips (review coming next week!) but they also released some new sunshirt colors, including that awesome forest green, a purple, and deeper shade of blue. you need another bridle you need another bridle…. Love all the purple offerings on that list too btw!! and that corgi sweater is adorable!! LOVE that croc noseband!! And dumb question, but what does A/W stand for? There is so much here that I need. So, so much. 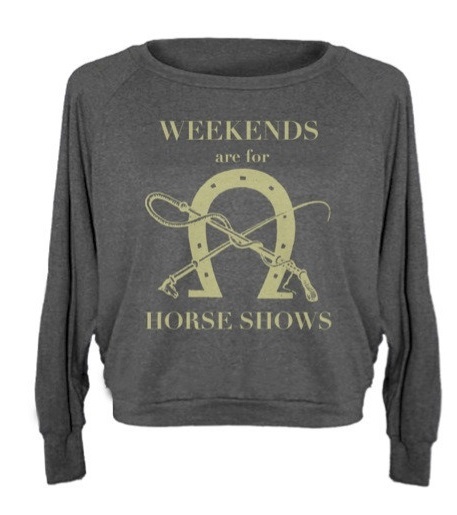 I actually bought the One Horse “Weekends Are For Horse Shows” sweatshirt at WIHS (the owners of One Horse are freakin’ awesome, byw), and it might be the most comfortable thing I’ve ever owned. 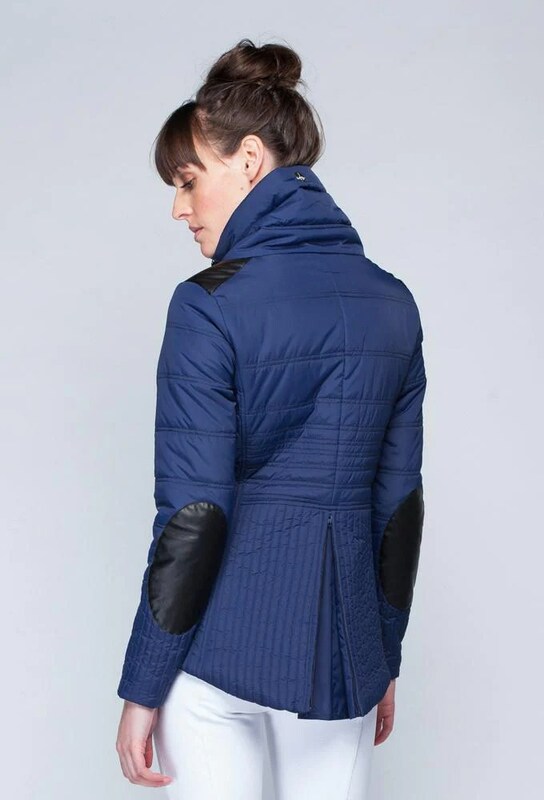 It’s generously sized without being bulky or unflattering, and the fabric is thin, yet still cozy and warm. I love this sweatshirt so much that I’m thinking about getting the American Thoroughbred one in red! Most of those breeches… no. Just no. what, you don’t want grandma’s curtains all over your lower body? the pants i most prefer to jump in at shows (mossy taupe-ish irideons) have tone-on-tone blocking down the leg and i actually really like it. it’s lower on my pants than in the ones you showed above – but still similar. also that patent noseband is maybe the first PS product that really has me panting a bit (aside from their browbands…). izzy would look SHARP in that, maybe… if it didn’t totally take over her tiny pony nose…. I want the purple floral breeches. Those are GORGEOUS. And the PS bridle with the changeable noseband is just brilliant. Someone needs to market a third-party option with less-classy things. I’m thinking neon. Cannot do the patterns. Purple breeches? I might be able to handle those though!! Ooh love the blue jacket. Love that it comes up on the neck, I hate neck drafts! Ummm, someday both of those ADE breeches will be in my grubby hands. If they were dark I would probably have them already. I’m coveting that Asmar jacket. A lot. And those aubergine breeches. A lot. I covet a lot of things from Asmar. And yes, you need that bridle, because I need to look at it. I think you should buy the bridle. You need another one. The sales lady convincede to try that Animo jacket on at Tryon. The fit is lovely, but the sparkles really um sparkle…haha, it’s gorgeous, but not for the faint of heart. Those Ghodo breeches are SO gorgeous! I love the purple color of the ADE breeches. And the dark purple and blue Kastel. And the Animo jacket, I think the print would be too subtle to notice once you are riding. So much pretty stuff. I want the ADE purple ones baaaaad. LOVE THE NOSE PLATES. Flash attachments make me want to vom. I pretty much just want the bridle so I can go back and forth between the croc and the fancy stitched. Those damn Swedes are geniuses. I need the Asmar… truly I do. I can’t decide if I love or hate the Get Set bridle. I love the idea of interchangeable but I’m not sure all the buckles wouldn’t overwhelm Dee’s delicate cob face. I would welcome the opportunity to find out.